A quick and easy dinner – even including making your own teriyaki sauce. I have two confessions to make. One, I didn’t use salmon in this salmon bowl. I used trout. Two, my trout wasn’t even raw; it was the steelhead trout leftovers from yesterday’s post. On the positive side, I did prove to myself that you can use fresh or cooked fish for teriyaki. I have to admit that even with the “alterations” to the recipe (as written below) it was exceptionally good. I’ve had so-so experiences with teriyaki salmon in the past. The dish needed vindication. I have a bit of a love/hate relationship with teriyaki sauce. I love its taste, but hate to buy it because of the price. I find it difficult to put a bottle in my grocery cart, because it’s so cheap and easy to make at home. That’s me in a nutshell – cheap and easy. I know the first meaning that comes to your mind, and I won’t deny it entirely. But I also am referring to how I approach cooking. If it can be done cheaply, and with little effort, it’s right up my alley. This recipe fits perfectly with that philosophy. If you can find salmon "on sale" this meal for four can be inexpensive, and remember frozen salmon always costs less than fresh. If you buy frozen steelhead trout it’s even more cost effective. I swear you won’t be able to tell the difference. We couldn’t. As far as "easy" goes, can you shove fish in the oven and boil rice? At the same time? I bet you can. Making teriyaki sauce is something we should all know how to do. It takes so few ingredients and they’re all kitchen staples. It literally takes about 8-10 minutes to make about 1-1/4 cups. That time is from chopping the ginger to turning off the heat under the pot when done. Homemade teriyaki is so much more flavourful than most of the bottled brands on the market. At least that’s my humble opinion. This one's a real keeper. Teriyaki sauce is quite versatile as well. Besides making actual teriyaki, it can be brushed on vegetables or meat (beef, pork, chicken, scallops, shrimp...) before grilling – or even used on hamburgers instead of ketchup and mustard and as the sauce for an Asian-inspired pizza. 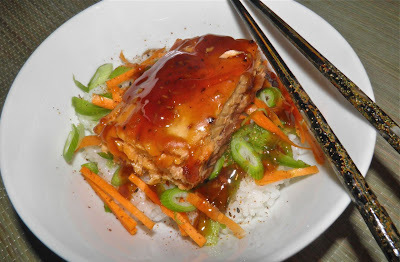 The only “strange” ingredient used in my salmon teriyaki is nanmi togarashi which is sold in Asian groceries – and probably larger grocery chains. It’s a mixture of ground chilli, sesame and orange peel. It adds a distinct, wonderful flavour boost. I would imagine most of us have eaten it at a restaurant and didn’t know what it was. Except for the teriyaki sauce this meal is quite healthy: raw vegetables atop rice with a delicious piece of fish. Let’s just pretend that teriyaki has no salt and sugar in it. Actually, let’s not. It’s amazing, amazing stuff. The recipe makes about twice as much as you will need, but I wouldn’t worry about it lounging in your refrigerator. I already have plans for pork teriyaki wraps. There’s only one working difference between what I prepared and the recipe below. Because I used pre-cooked fish I reduced the temperature of the oven slightly, and the cooking time to just until the fish was heated through. I have been severely disappointed more than once by the lunch-sized teriyaki salmon bowls that are sold at one of our larger grocery chains. I keep hoping “this next one will be good.” But it never is. Leave them in the display case. This recipe banished all my bad memories about teriyaki salmon. Give it a try. You’ll love it too. Preheat the oven to 375°F. While the oven is heating make the teriyaki sauce. Peel and mince both the garlic and ginger. 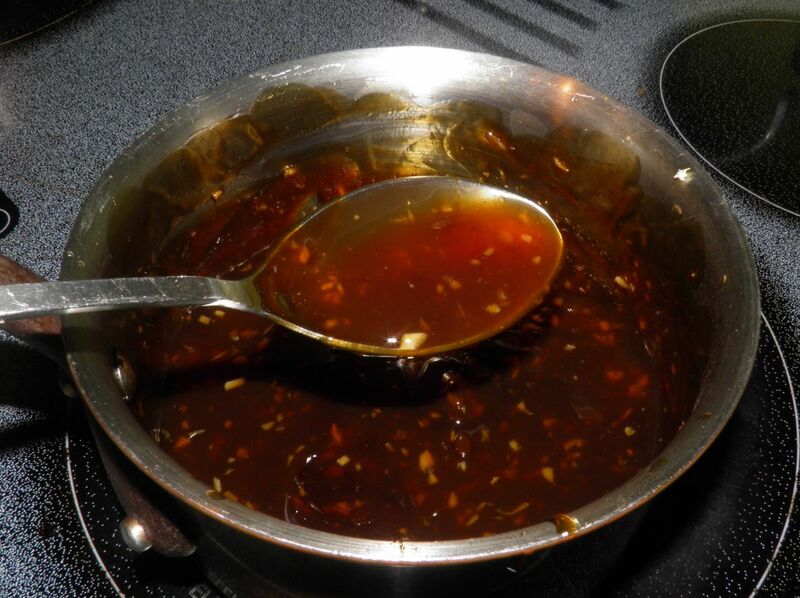 Place in a small saucepan with the water, soy, rice vinegar, brown sugar and honey. Mix the cornstarch and water together and stir in to the pot. Bring the mixture to a boli, stirring constantly. Reduce the heat to medium and cook for 4-5 minutes, Until very glossy and thickened. Any leftover teriyaki can be refrigerated for up to 1 week. 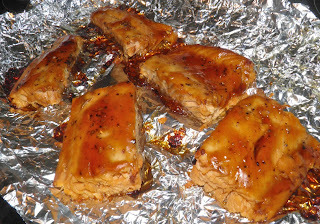 Place the salmon portions on foil in a rimmed baking dish. Generously paint the top of each fillet with teriyaki. 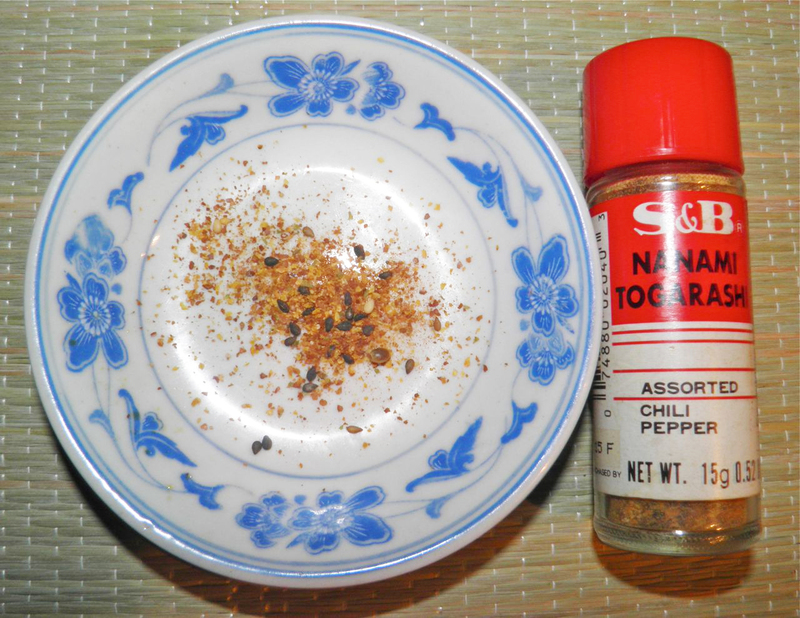 Sprinkle the top with salt and pepper. Bake in the oven for 15 minutes for every inch of thickness. While the fish is baking, prepare the sushi rice and chop the carrot, green pepper and green onions. 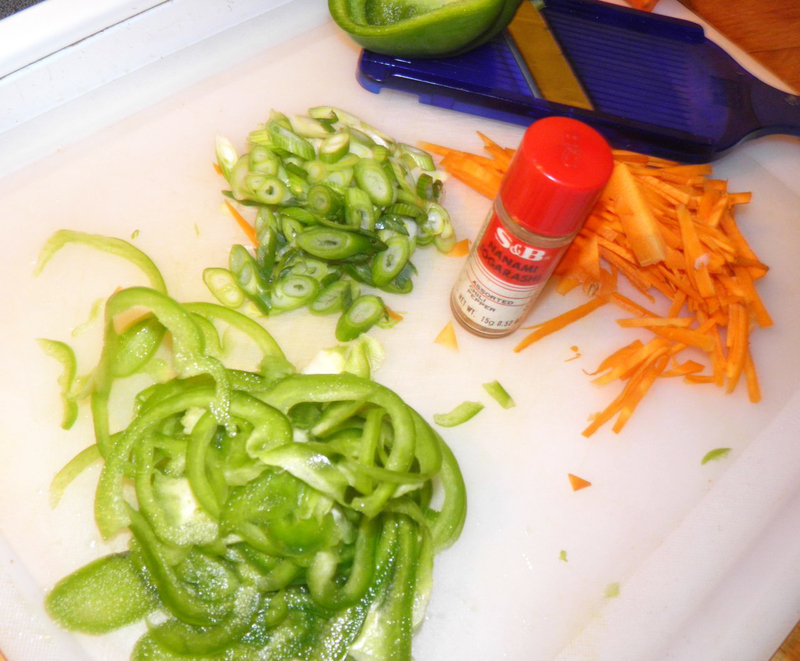 To make very thin pieces of carrot and green pepper use a mandolin. Then chop into strips. To serve, divide the hot rice among four bowls. Add some chopped carrot, green pepper and green onion and sprinkle well with the nanami togarashi. * For an interesting variation, try substituting the water for either orange or pineapple juice. ** If you don't have rice vinegar substitute 2 tbsp cider vinegar mixed with 2 tbsp water.